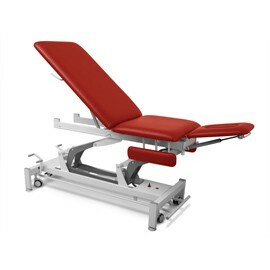 The table’s width (only 59 cm) allows the therapist to place the patient in the most appropriate position. In order to make the treatment of cervical spine or suboccipital pain easier, the size and shape of the headrest have also been changed. There are two versions of this 5-section osteopathy and manual therapy table: standard or tilt-table. As far as mobility is concerned, those models have either two small wheels and 2 anti-skidding legs (F0) or 4 elevated wheels with blocking mechanism and 4 anti-skidding legs (F4).